Armwood Editorial And Opinion Blog: Charles M. Blow ‏- America privileges whiteness. It exalts toxic masculinity. It worships wealth. In other words, America is a white supremacist capitalist patriarchy in which only a rich white man like Trump could even deign to do what he’s done, let alone be allowed to get away with it. Charles M. Blow ‏- America privileges whiteness. It exalts toxic masculinity. It worships wealth. 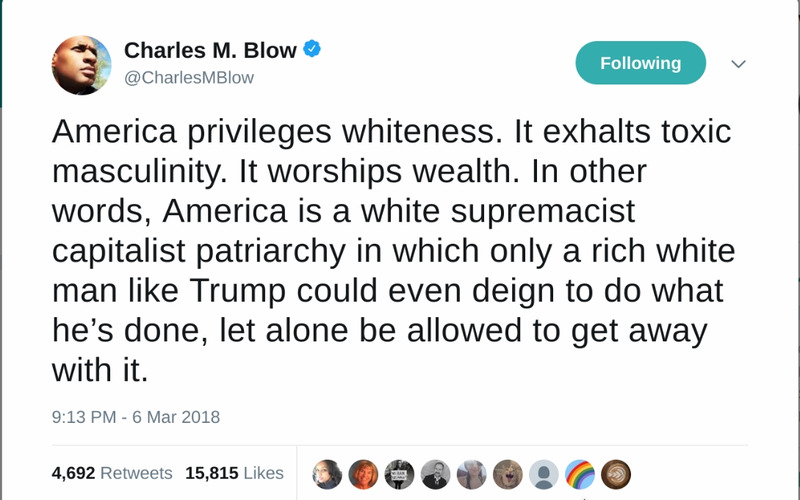 In other words, America is a white supremacist capitalist patriarchy in which only a rich white man like Trump could even deign to do what he’s done, let alone be allowed to get away with it.